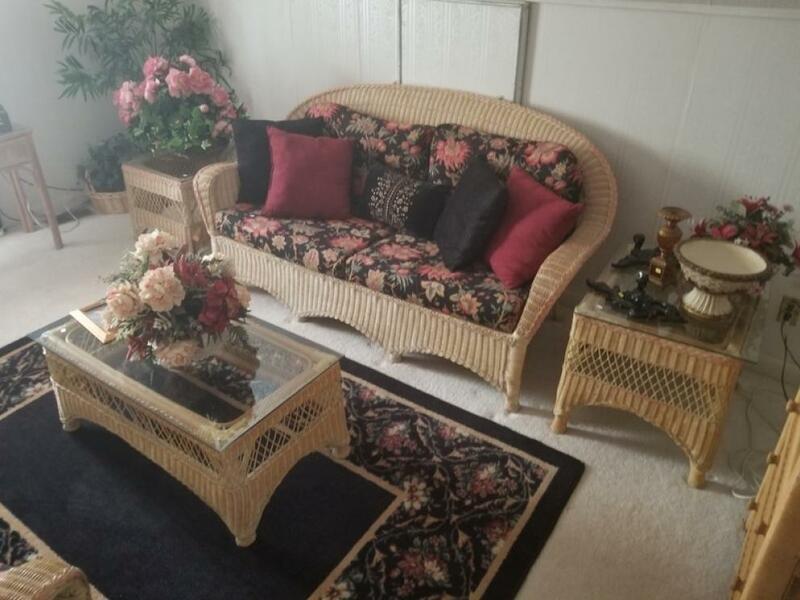 AUCTION ITEMS INCLUDE: A VERY NICE 8-PIECE NATURAL WICKER SET THAT INCLUDES 1 SOFA, TWO END TABLES, ONE COFFEE TABLE WITH GLASS TOP, TWO CHAIRS, ONE OTTOMAN, AND A NICE 3 DRAWER CURIO CABINET WITH LIGHT. ALL BEING SOLD INDIVIDUALLY. THIS HOME HAS MANY CONTEMPORARY CARPETS, AS WELL AS A FEW HANDMADE ORIENTAL RUGS. A QUEEN ANNE MAHOGANY DINING ROOM TABLE WITH TWO BOARDS AND 6 CHAIRS, A MATCHING BREAKFRONT, A NICE MAHOGANY SERVER, SEVERAL WING CHAIRS, A VERY NICE LIVING ROOM SOFA WITH TWO MATCHING CHAIRS IN EXCELLENT CONDITION, A CHIPPENDALE MAHOGANY DESK IN THE OFFICE COMMA WITH GLASS TOP. 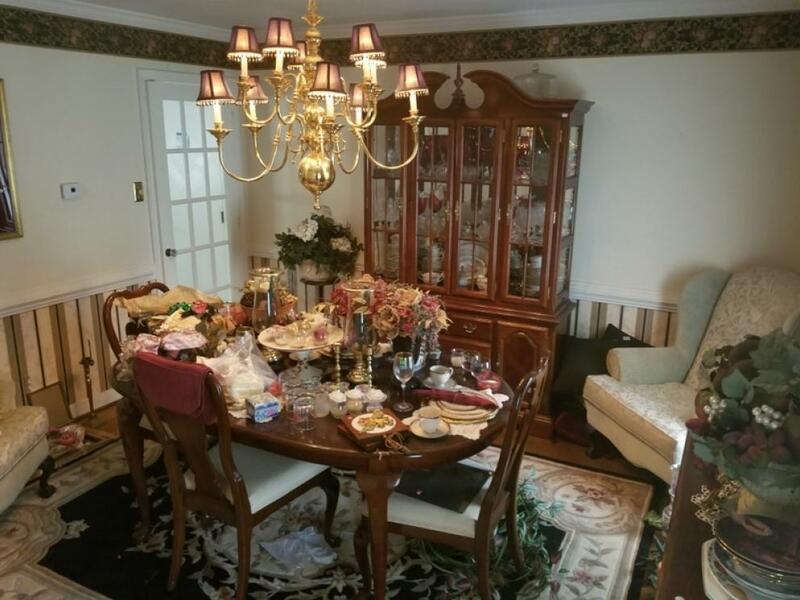 A VERY NICE SINGLE CARVED PEDESTAL BREAKFAST TABLE WITH GLASS TOP AND 4 DESIGNER CARVED UPHOLSTERED CHAIRS, A LARGE SET OF NORITAKE ROSE POINT CHINA, A SET OF LENOX CHINA, A FLOOR STANDING JEWELRY ARMOIRE IN THE MASTER BEDROOM, LADIES WRIST WATCHES AND A DRAWER FULL OF VINTAGE CLIP ON EARRINGS. VINTAGE 8-DAY JEWELED TOLE DECORATED CLOCK CIRCA 1960Ś, DECORATOR/ DESIGNER PILLOWS, A VERY NICE IRON AND GLASS SOFA TABLE WITH GRAPEVINE DESIGN, A BEAUTIFUL HICKORY MFG TRIPLE DRESSER, HIGH-END FRENCH PROVINCIAL DESIGN, 6 DRAWERS WITH BEAUTIFUL BRASS PULLS AND TRIM. UPSTAIRS IN THE MASTER BEDROOM WE HAVE TWO BEAUTIFUL FULL-LENGTH ALAN FUR COATS. THIS ESTATE ALSO HAS A COLLECTION OF DOLLS MANY OF THEM WITH STANDS AND BOXES. WE HAVE FOUR DENNIS BASSO DESIGNER IMITATION FUR COATS. IN THE OFFICE WE HAVE A HP OFFICEJET J5780 ALL IN ONE PRINTER, WITH AN HP PAVILION S 7000 COMPUTER AND MONITOR. THIS IS GOING TO BE A GREAT SALE PLEASE COME OUT AND PREVIEW! You can preview these items on Wednesday 5/9/2018 between 2pm-6pm. All items will begin to close on Thursday 5/10/2018 @ 7PM Eastern. You must pick up you purchased items on Friday 5/112018 between 2pm-6pm. This is the only time for pickup. 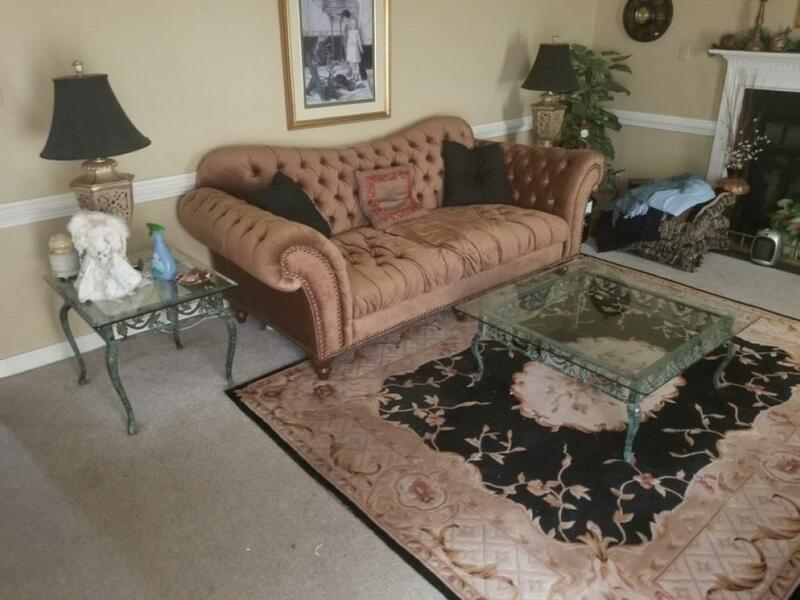 ALL ITEMS TO BE PREVIEWED AND PICKED UP AT 13813 Turtle Hill Rd Midlothian, VA 23112. All items will begin to close on Thursdayday 5/10/2018 @ 7PM Eastern.